An exciting fusion of comprehensive Western Australia touring with luxuriant relaxation aboard the Queen Elizabeth. Travel the Nullarbor from the comfort of your cabin aboard Indian Pacific. Tick off must see touring in Western Australia such as Margaret River, the Pinnacles, and New Norcia. Make passage to Adelaide aboard the stunning Queen Elizabeth. 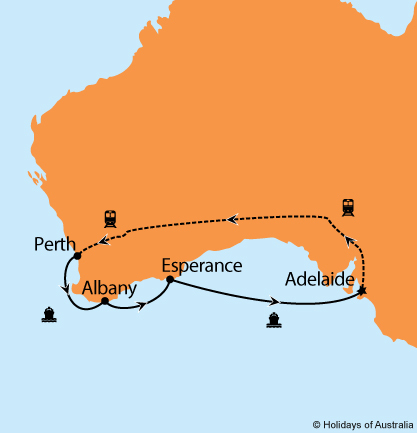 2 nights aboard Indian Pacific travelling from Adelaide to Perth in Gold or Platinum Service. Includes all meals, drinks and off train experiences in Cook and Nullarbor. 5 night stay in Perth at Pan Pacific Perth including breakfast. Half day Morning Perth & Fremantle City Explorer with Swan River Cruise. Full day Pinnacles Desert, New Norcia and Wildflowers tour. Overnight Margaret River Food & Wine Experience tour. 6 nights aboard Queen Elizabeth cruising from Fremantle to Adelaide with port calls in Albany and Esperance. Your cruise includes on board meals and entertainment. Images courtesy of Cunard, GSR, Tourism WA & SA Tourism.